Explore this dynamic European capital one delicious currywurst, vibrant food market, sunny beer garden and sprawling art gallery at a time. No matter what stage of life you’re in chances are high that Berlin is a big part of your travel diary. Whether that means you’ve already been there or are yet to tick it off your wish list, Germany’s capital, and one of Europe’s most dynamic cities, is rightfully one of the most desired and storied in the world, with a cultural scene so rich and diverse that first-timers could easily feel a bit overwhelmed. To help quell that confusion a bit, we’ve put together a list of five essentials for your first time in Berlin that you should definitely keep in mind ahead of any upcoming Eurotrip. 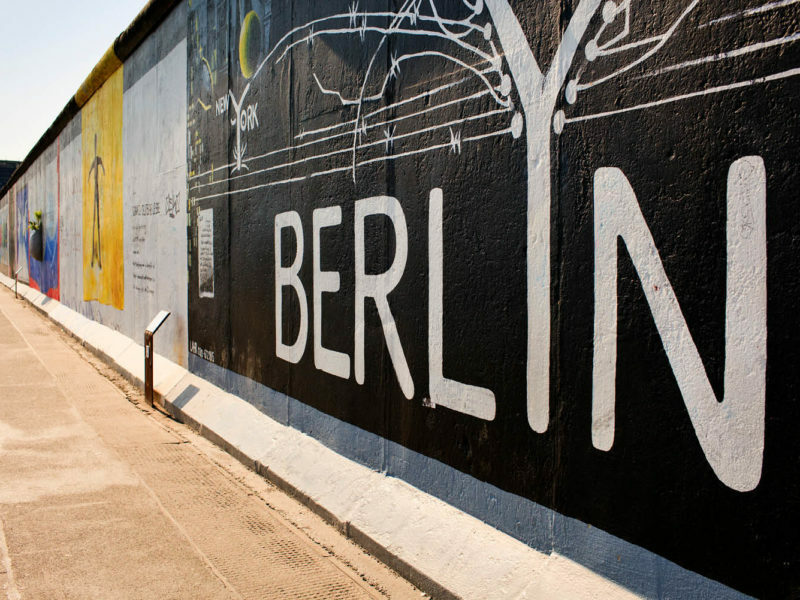 The Berlin Wall East Side Gallery is the largest open air gallery in the world (1.3km-long). It is situated near the center of Berlin. From the intensely intimate, to the outrageously strange, to the kind of inspiring, grand works found only in the world’s best museums, Berlin’s art scene is in a league of its own. 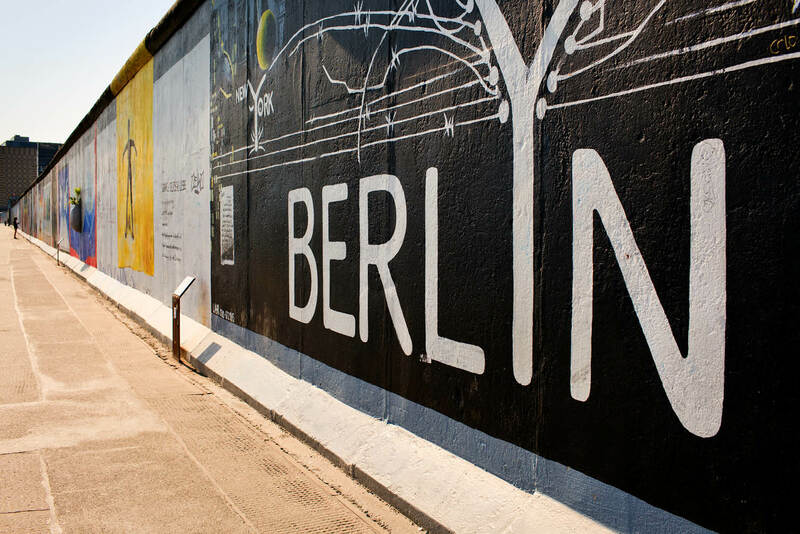 Then you have the elaborate – both political and otherwise – murals and protest graffiti that cover all 1316 metres of East Side Gallery, the longest open-air gallery in the world, transforming the largest remaining part of the Berlin Wall into an extraordinary and profound art walk along the Spree River. For art lovers there is no better place to be than Berlin, whether you’re delving into the dark side of the city’s history at the deeply affecting Topography of Terror, dipping into communist history at the DDR Museum, admiring the beauty of the newly relocated Käthe Kollwitz Museum, or hopping around the five major museums that dot the UNESCO World Heritage-listed Museum Island. And while you’re at it, don’t forget the endearing (and delicious) Deutsches Currywurst Museum. Learning about Germany’s complicated history and then seeing how art has layered on top is one of the most inspiring experiences you can have in Europe. Berlin’s art scene deserves all the fame and all the hype that regularly surrounds it. The city has been transformed by some of the most creative minds in all of Europe, extending arts influence far beyond the regular institutions and using the whole city as a canvas. You’ll find art all over the city, and it’s a great way to explore Berlin’s many different and distinctive neighbourhoods. The best way to museum hop is to grab a Museum Pass from Visit Berlin, which is around AUD $47 for free entry to over 30 different museums, including all of the ones on Museum Island. If that’s not enough for you, there’s plenty of street art tours you can take around neighbourhoods like Kreuzberg. Berlin’s staple fast food favourite is as hotly debated as any flagship snack across Europe. There’s one difference though, the currywurst blows just about all other European street food out of the water, and finding the best currywurst in Berlin feels like a true accomplishment. Why? Well for starters there’s an endless amount of stalls dedicated to serving that faultless combination of steamed and fried pork sausages, sweet curry ketchup and curry spice that dates back to 1949. Secondly (providing you’ve found one of the better ones), your taste buds won’t stop thanking you as that rich sauce dances across your tongue, with or without a spicy kick, and lays down a royal red carpet for those chopped pieces of pork sausage to come decorate your palate with pure and utter joy. You’ll find many locals swear by Curry 36, and it is most definitely one of the best entry points to currywurst a first-timer can have. As a bonus, if you’re heading along to Potsdam (which you should most definitely be doing) you’ll likely have to change trains at Zoologischer Garten (the destination for Berlin Zoo as well), ideal because there’s a Curry 36 stall right outside and, thankfully, it’s consistent with the popular brand’s main stall which is located on The Mehringdamm, a street in southern Kreuzberg. Convenience aside, there’s plenty of Currywurst stalls out there that are just as good, if not better, and highlight the surprising diversity that has been built from this simple recipe. You’ll be shocked at just how significantly different the taste is when you tweak any one of those three essential ingredients, and many chefs have their own special ways of bringing out these differences. Tuck into the homemade brilliance of Curry Baude, which is just outside of U-Bahn station Gesundbrunnen; queue up with the locals for the super popular Zur Bratpfanne in Steglitz; test your spice tolerance at Curry & Chili in Wedding; or dig into the very centrally located Curry Mitte in Mitte. Once you plough through the signature offerings at these stalls you’ll have a good idea of just how contentious this culinary topic is. Cloudy Autumn sky above old buildings in Berlin, Prenzlauer Berg. Head out of Berlin for the day and into Brandenburg’s capital of Potsdam. You’ll only be travelling around 40 kilometres so getting here won’t eat up much of your time, and the tiny effort is well worth it. Known as the former royal seat of Prussia, this town is resplendent with old world charm, featuring spectacular palaces and impeccably manicured gardens, the kind European fantasies are made of. One stroll through Sanssouci Park and a visit to its breathtaking palace is the most essential thing to do out here if you’re short on time, although Potsdam’s unmatched charm and rich history extends far beyond any one sight. The UNESCO World Heritage-listed capital has the type of opulence and grandeur to rival dream destinations like Versailles and Petergof, breaking away from Berlin’s urban sprawl with more than just a few flashes of aesthetic brilliance. There aren’t enough postcards in the world to quite capture the feeling of taking a leisurely stroll through the Dutch Quarter, standing in the imposing shadow of the New Palace, taking in the history of Cecilienhof Palace, or the elegance of Chinese House. During summer there will be plenty of tourists hopping around, but even the thick crowds can’t take away from the sense of tranquility framed by timeless beauty. Detail of the Nicolas Church (Nikolaikirche) in Potsdam (Brandenburg, Germany). The intersection of these two locales (defined by Oberbaum Bridge) is large enough to demand your entire time in Berlin, so if you’re only on a short trip it’s best to plan ahead as there is a lot of see and do. The city’s hipsters amass all throughout these two neighbourhoods, spilling in and out of the many galleries, nightclubs, eateries and public parks at all hours of the day. A sunset by the Spree river in Berlin, Germany. A few of the top things to do over on the Friedrichshain side of the bridge is visit multifaceted gallery and art space Urban Spree, walk that aforementioned East Side Gallery, party poolside at Haubentaucher, engage with the local creative scene at Michelberger Hotel, check out the former pumping station turned arts palace Radialsystem V, and tuck into one of the area’s many cafes, which includes Aussie-born Silo. Of course, night owls should always see if they can slide past the infamously tight entry policy and party all night at one of the most well-known and desired nightclubs in the world, Berghain (tip: don’t dress up, stick to street fashion as a start). Hipsters will want to spend most of their time in the dilapidated surrounds of RAW-Gelände, a former train repair station now covered by graffiti and populated by weekly flea markets, nightclubs, art spaces and bars, including disco-for-two Teledisko which is located in a repurposed phone booth. It’s not only one of the best examples of adaptive reuse projects in Berlin; it’s one of the best in the world. On the other side is Kreuzberg, and it’s a name many of those who haven’t been to Berlin should be more familiar with. The neighbourhood is massive so there’s much to do, including eating your way through the high density of Berlin’s best dining options, from street food to high-end restaurants. If you go to one market in Berlin, make sure it’s the Turkish Market which stretches just under a kilometre along the Landwehr Canal, on both sides of Maybachufer Straße, every Tuesday and Friday from 11am to 6.30pm; Kreuzberg is defined by its Turkish population, so plenty of delicious food and interesting wares can be found here. For a similar, but more food-focused, vibe head along to Markthalle Neun for the famous Street Food Thursdays before taking a stroll through Viktoriapark and perhaps visiting its small, historic vineyard or hidden beer garden. Whatever you do, don’t forget to eat at Burgermeister at least once, it’s right near Schlesisches Tor and does up some of the tastiest burgs in the city. Foodies will want to spend plenty of time walking the hip and fashionable Paul-Lincke Ufer, a street that runs along the Landwehr and is lined with some of Kreuzberg’s finest. Coffee enthusiasts should stop by Concierge Coffee, while just about everyone will find something they like. Just make sure you end up on Admiralbrücke for the sunset; the 10-metre-wide bridge has long been a local favourite for the public, and on a good day you’ll find hundreds of Berliners out just socialising, either sitting on the pavement or on the bollards. Countless beer bottle caps have been cobbled into the ground, which should immediately indicate that this is somewhere young people use as a gathering spot, much to the chagrin of older neighbours who have made numerous attempts to put a stop to the social institution. At around 10pm each night the police will come around to tell people to leave, but until then it remains one of the best and most immersive atmospheres in Berlin. You’ll make some new friends, no matter how shy you are. Other cities in Germany may be better known for their beer gardens, but Berlin has still got some of the best in the country. If you’re in a group then spending endless hours enjoying life’s finer things in a busy beer garden is a Berlin essential. The city’s oldest is still its best, so make sure you check out Prater for its huge yard, onsite restaurant and picnic-style outdoor seating. It’s located right on Kastanienallee too, which is a street in the heart of Berlin with plenty to see and do. For something a bit different, head along to Café am Neuen See in Tiergarten park; the popular summer destination is located right on the lake and hides in the shade of tall trees, making it one of the most picturesque and relaxing gardens in Berlin. Worth travelling for is Loretta am Wannsee, which overlooks Wannsee lake and does up some of the best hearty German food around.